Allow me to start by extending my congratulations to you Madame President and wishing the 73rd UNGA presidency much success. Let me also assure you that working with UN member states and the UN family, we look forward to advancing the seven priorities set in the UNGA73 agenda. 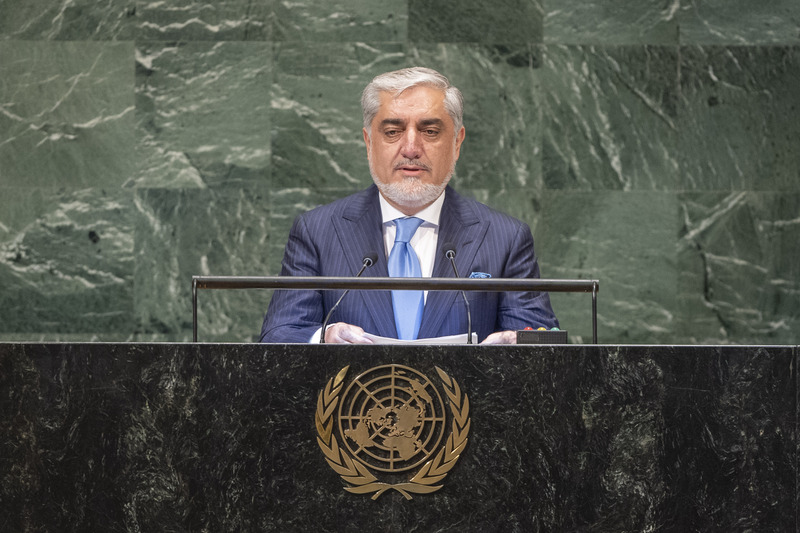 From this podium, I would like to provide the General Assembly with the latest in regard to the situation in Afghanistan – the gains, opportunities and challenges that my nation faces at this critical juncture – in addition to our views on other key global challenges. The record of accomplishments by this institution over the past 73 years demonstrates that wherever it might be, and whoever it might impact, we cannot escape the ripple effects of, or delink ourselves from the global, national, communal and human connectivities that bind us, whether in relation to the environment, climate, international finance or even the cyber and technology arenas. It is therefore critically important to go beyond just words, duplication of efforts or ineffective models that get inter-mingled and, at times, spur countervailing or lopsided interests. As Albert Einstein once said: WE CANNOT SOLVE OUR PROBLEMS WITH THE SAME LEVEL OF THINKING THAT CREATED THEM. Whether we are addressing hunger, acute poverty, climate change, overpopulation, terrorism, conflict, displacement, inequality or organized crime, we all share and own bits and pieces of the problems, in the same manner that we collectively benefit or learn from the solutions. As a result, we need to explore new means and identify new tools for reaching a wider consensus through more thoughtful dialogue and result-oriented action. Henceforth, to this day, we do not have a globally and officially acceptable definition for “terrorism,” a nefarious phenomenon used by rogue or politically-connected, criminal, state or non-state actors, using religious, ideological, economic or psychological cover to disrupt the status-quo, upend the global and nation-state order and reach a particular set of radical goals through the sheer use of indiscriminate violence that no religion in its undistorted form condones. While we are determined to fight with vigor newer versions of terror presenting themselves as remnants of DAESH in a few pockets inside Afghanistan, we are still struggling to fully comprehend the role that terror breeding grounds sanctuaries and funding pools – in many cases tied to criminal and illicit drug networks – play in the use and spread of terrorism. We are still trying to figure out how to render terrorism impotent as a policy tool used by some to further specific agendas. 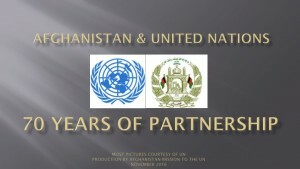 For example, Afghanistan has for almost a quarter of a century experienced the loss of tens of thousands of innocent lives and major infrastructural damage; It is partly because of geography, and partly because of short-sighted strategies and regional agendas that have generated an umbilical reliance on non-state actors used to keep others unstable through violence and the promotion of extremism. It has resulted in complacency and impunity. Thus, we need to do more and go beyond the ineffective norms to bring about change and accountability. We have asked our neighboring states, especially Pakistan, to help targeted societies – including their own – deal with this menace. We are looking forward to the timely and effective implementation of the recently agreed Afghanistan-Pakistan Action Plan for Peace and Solidarity (APPAPS). All stakeholders need to agree to treat all shades of terrorism as one, shut down the breeding grounds and sanctuaries and to prosecute or repatriate the violators. The response thus far has been sparse and insufficient. We are working with all countries near and afar to bring about better results. On that basis, Afghanistan stands for the balanced implementation of all four pillars of the UN Global Counter-Terrorism Strategy; and non-compliance must be seriously addressed as well. My country has also begun a process of structured cooperation with the UN Office on Counter-Terrorism and we are supportive of regional initiatives through forums that focus on such priority concerns. We will continue to engage and work with regional stakeholders in this regard. Since we last met, Afghanistan has turned a page and made unprecedented overtures to the Taliban to be part of a credible Afghan-owned and Afghan-led peace process that could lead to a just and comprehensive political settlement through talks and reconciliation. Unfortunately, extraneous agendas prevented us to replicate a second ceasefire more recently. But we will not rest, and we have vowed to pursue what is right and attainable. I want to express my sincere thanks to all nations, especially the United States, concerned nations and parties, including the Governments of the Kingdom of Saudi Arabia and Indonesia- both of whom recently hosted Ulema gatherings – the UN and others for encouraging all sides to set the stage for a process that would lead to talks and a just and comprehensive negotiated settlement. Looking at the 25 year-long record, a pre-requisite for talks is to learn from the history of peace engagements. We see that a dual approach is necessary to make sure that we win the peace but also protect and preserve our people’s gains and hard-earned achievements; They include the constitutional order, freedom of expression, human and gender rights and creating economic opportunities. I want to pause here and pay tribute to Afghans who continue to suffer as a result of violence, as well as to our valiant national security forces for their steadfast defense of our nation and for standing tall and strong at the frontline against terrorism. Two important popular tests are ahead in Afghanistan: Parliamentary elections slated for next month and presidential elections for next year. Drawing on past experiences, both President Ashraf Ghani and I agree that political legitimacy is derived from the will of the people. While we pursue peace efforts and deal with security and governance challenges, we are reminded that, eventually, we need to make sure that, given our circumstances, the electoral process is trust-worthy and that the electorate can agree to a fairly credible and legitimate outcome. Regardless of who wins or loses, Afghanistan’s future rests on nurturing national consensus that provides unity of purpose aimed at peace and political stability deriving legitimacy from foundations that are pluralistic, inclusive and democratic. In this regard, I want to thank the United Nations – UNAMA in particular – the European Union and all other contributors and donors for helping us move the process forward. Furthermore, we look forward to the upcoming Geneva Ministerial on Afghanistan in November. It will be an excellent occasion to evaluate our work and the path ahead with the donors since we last met. On the humanitarian front, Afghanistan also faces the daunting tasks associated with an impending drought, refugee resettlement and internal displacement caused by climactic and natural abnormalities, food insecurity and security threats. Estimated to impact two-third of the country and the livelihoods of more than four million people, with the potential to force a million more into migration, we are in dire to attend to their humanitarian needs. I want to thank the Office for the Coordination of Humanitarian Affairs, other UN agencies, NGOs and donors for their contributions and hard work on the ground, however, we urge the international community to fully fund Afghanistan’s Humanitarian Response Plan 2018-2021. The peaceful settlement of disputes and protection of oppressed peoples are core principles of the UN Charter, which benefit the promotion and preservation of international peace and security. As a war-ravaged country, we sympathize and feel for the people of Syria, Yemen and other victimized communities around the world, in the same manner that we stand for the basic rights to protection of the Rohingya population in Myanmar. Afghanistan stands in full support of all UN and other international efforts aimed at achieving a just, comprehensive and lasting settlement to the question of Palestine, including a UN General Assembly call for an international protection mechanism for civilians. Moreover, the UN’s refined peace-building activities should provide due focus on the principle of national ownership; implementation of the 2030 Agenda for Sustainable Development; and promoting greater coherence among relevant UN entities and agencies and development. In regard to the reform agenda, we stand in full support of efforts aimed at strengthening the role of the UN in the context of the Secretary General’s initiatives. The creation of the Department of Political and Peace-building Affairs is a welcome move, as is the formation of the Office of Counter-Terrorism. We are looking forward to the implementation of the resolution adopted on the Repositioning of UN Development System and believe it will enhance our achievements in the formation of One-UN in Afghanistan. Afghanistan’s active role within the UN system is currently more pronounced than ever before. Our chairmanship of the Third Committee during the 73rd session comes at a crucial time as we have aimed to initiate and adopted several resolutions on shared themes that include victims of terrorism and threats of IEDs, in addition to refugee and migrant issues, rights of children, women’s empowerment, human rights, social development, and other relevant Committee agenda items. Furthermore, Afghanistan’s election to the UN Human Rights Council for the first time in 2017 marked our commitment and showcased our achievements in this regard. We remain a party to major international protocols and conventions on human rights. 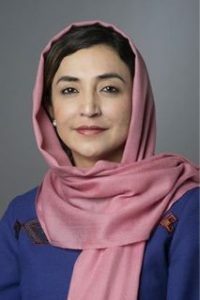 I am pleased to inform that Afghanistan has recently passed a set of national legislation prohibiting cruel and degrading treatment, endorsed the Law Inhibiting Torture, on Combating Human and Migrants Trafficking, Criminal Procedures Code, and on Prohibition of Children Recruitment in our Security Forces. On the latter, we are working closely with the office of Special Representative of the Secretary-General on Children and Armed Conflict. I want to leave this podium today by presenting a bold concept – also recently mentioned by President Ghani – that can form a new visionary paradigm for my country and our region as we strive to end four decades of conflict and enter a new phase free of violence and forced implementation of stagnant ideas and spoiler habits. It is a concept that dwells on Afghanistan over the next few years becoming a platform of cordiality for regional and hemispheric cooperation, in sharp contrast to being pushed and pulled toward becoming an area of instability and confrontation. Our people, who pose no danger to anyone, are demanding a fundamental change where they can play a constructive and collaborative role across boundaries, and help turn their country into a roundabout of people, goods, services, communications, cooperation and ideas across the wider region. I believe that with your help we can turn this concept into reality. We hope to further engage our regional partners in helping us bring this vision to fruition. I hope that this Assembly and all concerned member states play their supportive and positive role to put an end to years of agony and open a new path leading to durable peace, stability and prosperity.